Halo Legends, the anime collection from the massively popular game series, has landed a soundtrack of its own and has a generous mix of reconstructed old material that’s been reworked for the animation and a fair smuttering of new material too. The first eleven songs are reworkings of older tracks from the original games. “Ghosts of Reach” is a beautiful choral/orchestral opener that is soaked in atmosphere and history. It just has that sense of utter foreboding that is so tangable you can taste it. “Brothers in Arms” brings in the military drums and marching string base for a powerful militant track not far off a massive film scene. What is great is there’s a strong melody to this track which is often lost in these great militant pieces. “Truth and Reconciliation” is both shimmering with carillions but massive with heavy drums and brass in this six minute epic. It really is a thing of beauty. It never sits still and swiftly moves from calm and sorene to tension building tablas to climactic brass crashes. “Opening Suite 1” gives you time to catch your breath with an etheral vocal section before “Opening Suite 2” switches to a slightly uneasy but still quite gentle string track. “Halo” then mixes the two with added tabla percussion for a rousing track that really gets you fired up for battle. “Desperate Measures” ups the ante more with great big cymbals and majestic brass melodies pounding through your speakers before “Cairo Suite 1” gives you a break on the rollercoaster ride with a tender but bittersweet track full of lots of minor keys and tense high strings to squeeze all the emotion out of you. “Dela Halo Suite” is then a beautifully sweeping track that scoops you up and takes you on a journey through a lot of different elements of other tracks just in passing, almost making it a best-of. “Machines and Might” is brutish and bold, never letting up with its rising tension before “Remembrance” rounds off the opening selection of reworked tracks with a downbeat chorus adrift in the air. From here the majority of the tracks are new compositions. With the elegent “Blade and Burden” being a certain standout for possessing a certain charm and beauty with some lovely female ad-libs over harps and harpsichord. “Steel and Light” continues the much more Eastern feel with a minimal wind piece with token instrumentation around it. “Impend” has a distinctly different sounding orchestra that’s much more rounded and less Hollywood in style and is suitably understated before “True Arbiter” uses downplayed string arrangements and acoustic guitars to great effect in what is a very sad song and one that feels very isolated and lonely. “The Maw” (no, not that Maw!) is a very regal choral piece before “Unforgotten” returns to the solomn wandering orchestra again for another heartwrenching piece with added piano. “Shattered Legacy” is a tragic opera but is so short, I was really wanting more. “Out of the Darkness” is more ambient than all the other tracks and does feel very aftermathy. “High Charity Suite 2” however has more of an aftermath feel to it, like a cleansing has begun. “Into Light” is a short cinematic track before the epic “Sacred Icon Suite 2” comes in, feeling like an end credit or final battle track. It has such an epic scope to it, it lifts you up to the heavens and opens its wings with everything going at full pelt. Fantastic. “Rescue Mission” is another dramatic rousing piece before the filmic “The Last Spartan” takes over with another rousing track. Rousing is something Halo Legend’s does a lot, but does very, very well! The ever constant marching forward with each bar adding something new in – it’s a winning formula. “High Charity Quartet” is similar to the the suit but is just a string version of the beautiful track. “Here in Peril” is another short but militant track that builds and builds in the minute and a bit its on air for. “Earth City” however is a three and half minute orchestral extravaganza. Everything and the kitchen sink is present making sure everything gets the most bang for its buck, another great example of utilising a full orchestra. “Risk and Reward” is a nice orchestral repost before “Exit Window” goes superhero on us with a massive theme not out of place in a superhero rescue before “Finale 2” ends in typical Abyss fashion with an interesting otherworldly ending. 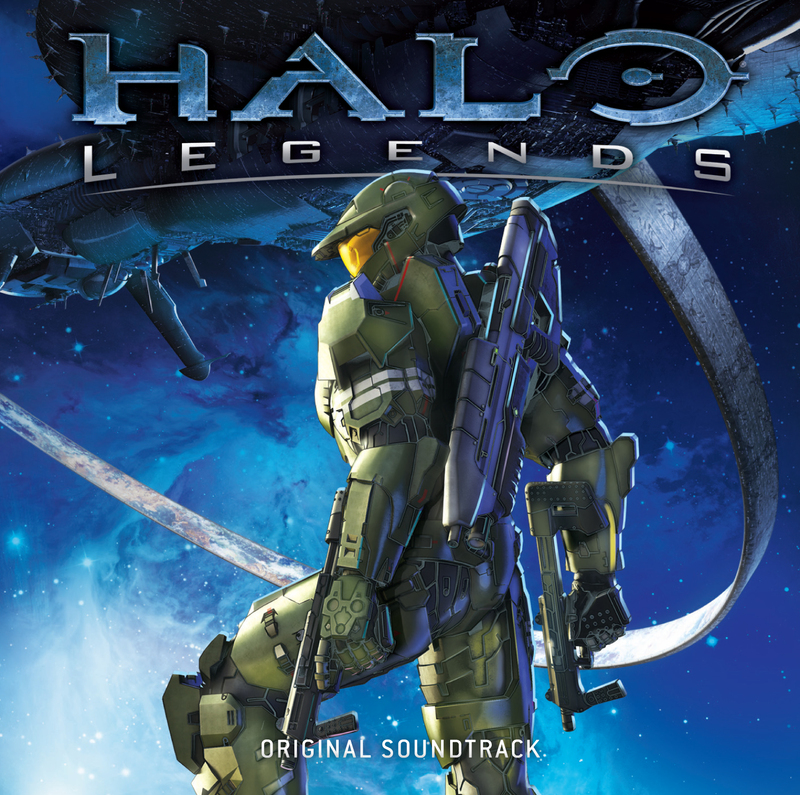 Halo Legends is a soundtrack that is both epic and humble at the same time. Some tracks have such a massive scope, it’s like your right on thr battlefield battling for every breath. Other tracks are more subdued and its those that really balance out all the tense action and make it much more palettable. Halo Legends is a fantastic soundtrack. Fans of the original game soundtracks will feel right at home and there’s a few new directions to keep everyone happy. Highly recommended.